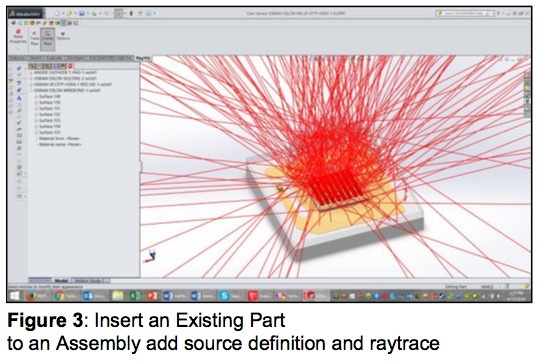 RayViz adds ray tracing functionality to SOLIDWORKS models. 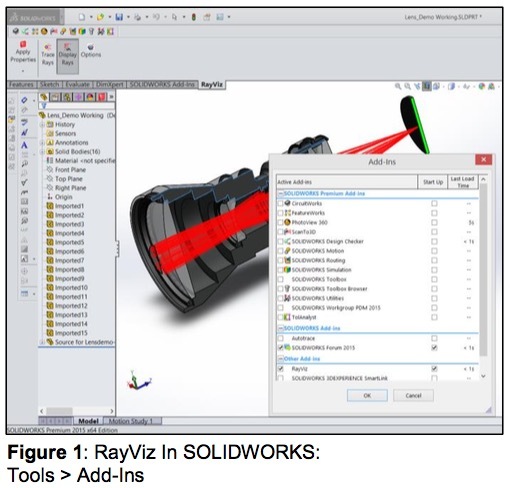 RayViz is an add-in to SOLIDWORKS that allows users to apply and save optical properties and trace rays directly in the SOLIDWORKS CAD model. 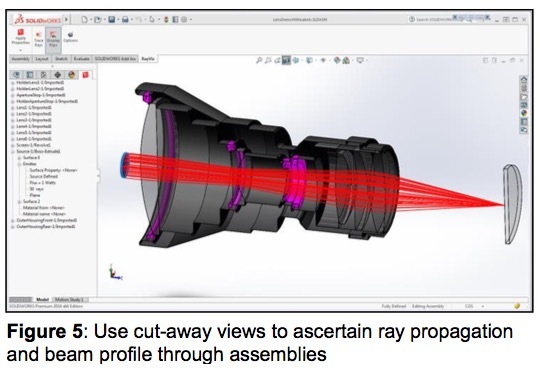 With RayViz, a single model is used by both TracePro (for ray tracing and optical analysis) and by SOLIDWORKS (for mechanical design and applying optical properties) to ensure data integrity. RayViz also adds ray tracing functionality to SOLIDWORKS models by doing a simple ray trace to verify geometry, visualize rays traced from any surface, and check ray paths. Designers significantly accelerate the product development process without sacrificing performance or functionality due to RayViz’s easy-to-learn interface and minimum setup time. The design, tolerance, and documentation of optical systems require a high level of collaboration between optical and mechanical engineers. Design teams face increasingly shorter product development cycles and lower R&D budgets. 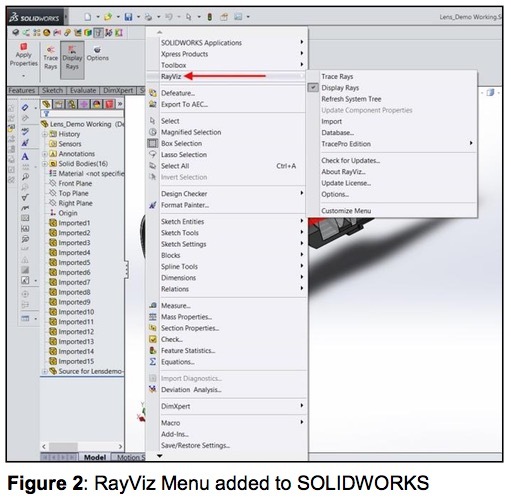 In order to effectively manage collaborative work flow, RayViz not only facilitates optical design, but also enables the overall development process by integrating the optical model into SOLIDWORKS. Create parts and assemblies in SOLIDWORKS. 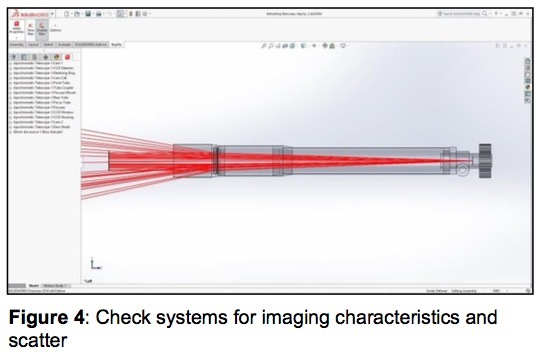 SOLIDWORKS alone, however, will not accommodate the definition of optical properties of parts or assemblies. With the RayViz add-in, define and modify the optical component geometries and the optical material and surface properties within SOLIDWORKS. The ray tracing capability in RayViz is a complete visualization tool to verify the optical and illumination ray paths of any system. Rays can reflect, transmit, scatter, and be absorbed according to the surface property applied to eachface and material property applied to each body. RayViz shows all the possible propagation paths allowing the you to visually check for vignetting, focusing, crosstalk, and stray light problems. Open the saved model in TracePro and immediately notice the display of the SOLIDWORKS model in the TracePro model tree. Imported geometry can be manipulated with full move, copy, rotation, and Boolean capabilities. Then use TracePro’s analysis capabilities to simulate performance. Return to SOLIDWORKS to modify the geometry and optical properties, and archive the updated model. Repeat these steps as needed to refine your design.